Clear, sunny skies today will soon turn cloudy with plenty of snow on the way starting Saturday. Expect periods of wet, heavy snow for elevations above 7,000 – 7,500 ft on Saturday morning through the afternoon with rain below that level. Heavy snow for all mountain elevations Saturday night into Sunday, with off and on snow showers through Tuesday morning before the next storm reaches us Tuesday evening. For all northern and central Utah mountain resorts, expect a wide range of weekend snow totals through Sunday night as of now to be from 8-25 inches (details of regional snow totals below). Marcel and Lucas have done a phenomenal job over the past two days describing the upcoming change in our weather pattern. That change is about to be realized! For the past several days, we have been on the eastern periphery of a highly amplified ridge. That ridge has moved over us today, giving us a glorious, sun-filled morning and afternoon. As can be seen by water vapor imagery below, though, there is a low pressure system off the California coast that’s being fueled by a ton of mid-level moisture from the tropics. In other words, there is a large “atmospheric river” that is about to impact the western United States and the Intermountain West. Behind that (looking at the system north of Hawaii in the water vapor imagery below), is the next system that will move into our region. For today, though, I hope you enjoyed the sunny skies and last bluebird day we’ll see for awhile! Things will start getting interesting for Utah beginning late Saturday morning. Mountain rain and snow showers likely will begin around 9-10 AM tomorrow. 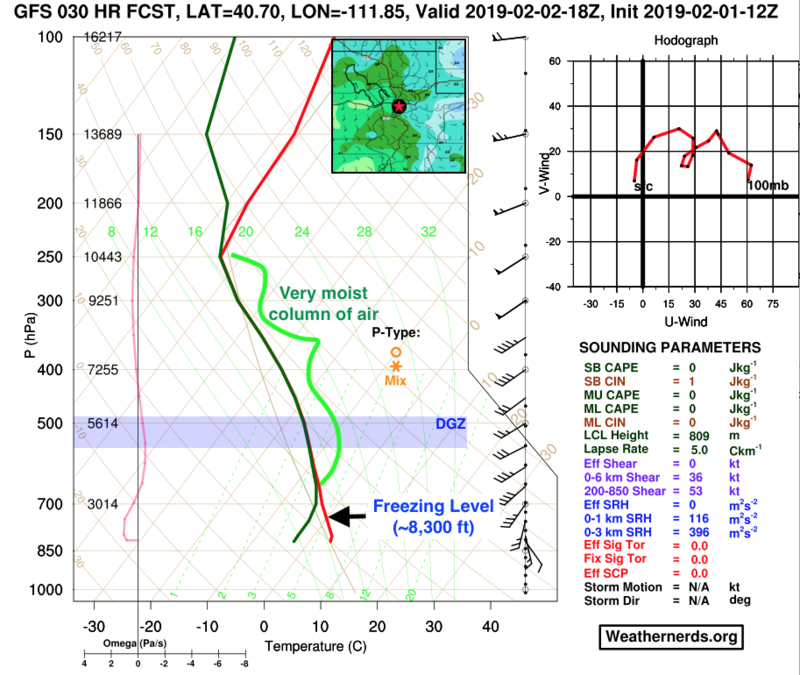 Looking at the GFS forecast skew-T below, you can see that a large column of moist, saturated air is forecast for tomorrow morning as the temperature (red line) and dew point (dark green line) are nearly identical from just above 700 hPa to the top of the troposphere (~250 hPa). The freezing level will be low, though (~8,300 ft), so that is why we will expect rain to fall at elevations from 7,000 – 7,500 ft. and below through much of Saturday morning and afternoon. Above those levels, though, expect heavy, wet snow to fall… soggy skiing conditions, but at least it’ll be good for building up a nice new base! Activity looks to be relatively light through the day on Saturday, but should pick up in intensity Saturday night through Sunday morning as a mid-level vorticity maximum (rising/rotating flow) pushes through the region. Snow levels should gradually drop in elevation through late Saturday evening as well to around 5,500 ft. Heavy snowfall rates will taper off by mid-morning Sunday, with showers lingering throughout the day and evening. Snow totals in the higher elevations of the snow resorts through Sunday are as follows. During the day on Monday, there still will be some snow showers between the weekend storm and the next low pressure system that should impact our area. Models have trended in slowing the next storm down a bit, so that system should reach Utah by Tuesday as a positively tilted trough. Positively tilted troughs are generally weak; we usually want a trough to be negatively tilted (or at least neutrally tilted) for more impactful weather. However, we still should get decent snowfall amounts with that as the system is colder. Some global models like the ECMWF show a deformation zone (area usually on the north/northwest side of a low in which there is horizontal stretching with a decent precipitation shield in a northwest to southeast orientation) sitting over us for awhile, and also some cold advection showers behind the storm that could allow for some decent snowfall accumulations to add up in the mountains (and maybe even the valleys!). Definitely stay tuned for more information about next week’s potential storm, and of course come back tomorrow for updates on our weekend snowfall predictions. Have a great weekend, and be safe getting up to and skiing out on the slopes!